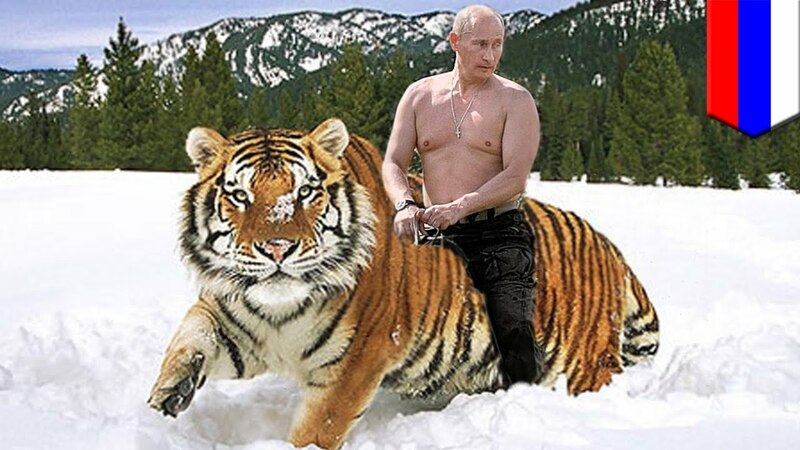 As you might imagine, riding a tiger is not for the fainthearted. Tigers have been known to eat people. So why is the Republican party riding several tigers, all at once? Follow the money. CEO Rex Tillerson — an extreme Russophile and long-time director of a US-Russian oil company — is Trump’s puzzling choice for Secretary of State. I say “puzzling” because the long-serving Exxon employee (from age 23!) has no qualifications to be secretary of state — other than a history negotiating major oil deals with countries like Putin’s Russia, which in any sane world would actually disqualify him or at least force a recusal from all State Department dealings with Russia. A half trillion dollars to line their pockets and prop up the Russian economy offers a tangible motivation for team Putin to get Trump elected. And it was Tillerson who had made the $500 billion oil deal with Putin that got blocked by sanctions. It matters what Trump and his cabinet do in response to the overwhelming evidence that Putin did clandestinely interfere in the election. Indeed, if Trump and Tillerson instead end the sanctions that are blocking the Exxon-Rossneft deal, it is going to look suspiciously like a half trillion dollar quid pro quo for Putin’s help getting elected. Trump is not even President yet, and already he has begun the process of paying off Putin. Ending sanctions will be the first step in putting vast amounts of money in Trump’s and Tillerson’s pockets. At Tillerson’s confirmation hearing on Wednesday, the former Exxon Mobil CEO got a number of questions about his conflicts of interest — his huge interest in Exxon, through the direct ownership of about $54 million worth of shares, plus another $175 million in a financial contract called restricted stock units (RSUs). After six years of thinking, and more than 50 “Repeal” votes, the Republicans still have not developed a “Replace” plan. But Mr. Trump is optimistic it magically will appear. “It’ll be repeal and replace. It will be essentially, simultaneously. It will be various segments, you understand, but will most likely be on the same day or the same week, but probably, the same day, could be the same hour. “So we’re gonna do repeal and replace, very complicated stuff. And we’re gonna get a health bill passed, we’re gonna get health care taken care of in this country. “You have deductibles that are so high, that after people go broke paying their premiums, which are going through the roof, the health care can’t even be used by them because their deductibles bills are so high. “ObamaCare is the Democrats’ problem. We are gonna take the problem off the shelves for them. We’re doing them a tremendous service by doing it. We could sit back and let them hang with it. We are doing the Democrats a great service. “So as soon as our secretary is approved and gets into the office, we’ll be filing a plan. And it was actually, pretty accurately reported today, The New York Times. And the plan will be repeal and replace Obamacare. If you understand that word salad, please send your translation to Mr. Trump, because it’s clear he has no idea what he’s talking about. In the coming days, you will hear many stories about how Obamacare has raised healthcare prices for many people, totally ignoring the 20 million people who have obtained healthcare via this program. But it’s a huge improvement over the current Republican “screw them” plan to force millions of people to go without healthcare insurance. Why do the Republicans want to end Obamacare? Again, follow the money. I predict that any Republican plan will involve privatization, benefitting the healthcare industry moguls, while costing the poor and middle-classes more. Privatizing elements of ACA will be the next step in putting vast amounts of “thank you” money into Trump’s pockets. And, as always with the political right, it will widen the Gap between the rich and the rest. Rex Tillerson, the former Exxon Mobil chief, would head up U.S. international negotiations on the matter under the Paris climate agreement. Yet Tillerson stated that while humans are changing the climate, “our ability to predict that effect is very limited” — a dubious assertion when it is clear that more emissions equal more warming, and when scientists can now directly connect the volume of emissions with particular temperature ranges for the planet. If Trump and Tillerson work together to kill the Paris climate deal, the last best chance to save Americans from catastrophic climate change, that will look like they are putting Putin’s interests and Exxon’s profits above America’s national interest and the health and well-being of our children. It bears repeating that ExxonMobil’s future is inextricably tied to their stalled oil deal with Putin — and their future drilling plans would benefit from continued global warming and melting of polar ice. Presumably, denying climate change and ending efforts to prevent it, will be the next step, not only in paying off Putin, but in putting vast amounts of money in Trump’s and Tillerson’s pockets. WASHINGTON — Trump is looking to “unleash the potential” of private investors to boost the national transportation networks that underpin the U.S. economy, Transportation Secretary-designate Elaine Chao told lawmakers Wednesday. Unions say that as labor secretary, she mostly sided with industry when enforcing labor and safety rules. Donald Trump recommends providing $137 billion in tax credits to infrastructure investors. But transportation experts note that investors are interested only in transportation projects that produce revenue, such as toll roads, and there are relatively few large projects like that. Providing tax incentives runs the risk of providing a windfall to investors for projects that would have been built anyway. Chao’s department frequently faces pressure from industry to relax safety rules and block new ones. (She, having been) associated with conservative think tanks, is likely to lend a sympathetic ear to industry pleas for less regulation. See the pattern, here? Less safety for the workers; more profits for investors. Donald Trump has no moral code. He is all money all the time. If ever you are puzzled about something Trump does, you need only to follow the money. The road may be convoluted, even hidden, but somewhere at the end of every Trump trail, you will find his pot of gold (plate). Riding tigers is dangerous. Trump takes the risk that the voting public finally will catch on to his unrelenting greed and toss him out of office. But the outcome will be worth the risk if by then, he has amassed billions in profits for his various businesses and his family. You know the old saying, “No risk, no reward.” And when the potential rewards are so staggeringly vast, Trump and his “Trumpites” are willing to ride the tiger — the public be damned. The looting of America has begun. WASHINGTON (AP) — President-elect Donald Trump’s meetings with CEOs seeking federal approval for major mergers are raising red flags for ethics lawyers concerned about the possible erosion of a firewall between the incoming White House and regulators reviewing those billion-dollar deals. Trump met this past week with the heads of German chemical company Bayer and seed and herbicide giant Monsanto, who made their case for their $57 billion merger. The deal would likely need to be approved by Trump’s choices to lead antitrust enforcement at the Justice Department. On Thursday, Trump sat down to discuss jobs with the chief executive of AT&T, which is trying to acquire Time Warner. Does Trump have a financial relationship with these companies or any financial interest in their profitability? You have no idea. He refuses to reveal his tax returns. Presidents typically keep their distance from such reviews, so as not to appear to be exerting political influence on a regulatory process intended to evaluate the impact a merger could have on competition and consumers. Trump’s private sessions suggest he may be less worried with appearing to be close to pending deals that require government approval. “While it’s true the Department of Justice is under the executive branch, it’s not appropriate for the president to make that regulatory decision — and certainly not for political considerations,” said Bruce Green, a law school professor at Fordham University who specializes in ethics. Which is more important to Trump — the appearance of ethics or money? Green equated the meetings to a 2016 campaign controversy: Bill Clinton’s conversation with Attorney General Loretta Lynch on the Phoenix airport tarmac at a time when the Justice Department was looking into Hillary Clinton’s use of a private email server. “If the conversation is private, it will raise questions and suspicions,” Green said. Trump already has “solved” those “serious conflict problems. He has stated that by law, the President does not have conflict of interest problems. He can do anything he wants. The looting of America is in its early stages.